Countless times throughout my career I have heard people say “I know the print calls for a 3/16” fillet, but I know it is not enough.” As a result, the welds end up being a 5/16” fillet. And while there are times when extra reinforcement is necessary, have you ever stopped to ponder the trade-offs for over-welding? On the surface, increasing the weld size from 3/16” to 5/16” doesn’t seem like that big of a deal. All the welder has to do is increase his oscillation while performing the weld. The welder is much more comfortable making the larger weld and it doesn’t take that much more time or money. Or does it? Suppose a job is bid based on prints calling for a 3/16” fillet and there are approximately 5,000ft of welds. The job will be welded using a 0.045 gas shielded flux-cored wire. The shielding gas is C25 set at a flow rate of 35 cfh. Typical welding procedures are 350 ipm wire feed speed and 25 volts. Using the above procedures, 5,000 ft of a 3/16” fillet weld would require about 465 pounds of weld metal or about 535 pounds of flux-cored wire to be purchased (based on 87% wire efficiency). A 5/16” fillet requires a staggering 1,290 pounds of weld metal or about 1,483 pounds of wire to be purchased. That is nearly three times more wire that needs to be purchased. Ouch! Likewise, the 3/16” fillet requires approximately 71 hours of arc on time (just arc on time – not including breaks or pauses in the process). The 5/16” fillet requires approximately 196 hours of arc time. Again, nearly three times longer to complete the required welding (at a $50 an hour labor and overhead rate, this requires an extra $6,250 of labor). These extra hours of welding require a minimum of 13 extra cylinders of gas. During tough economic times, we are all looking for ways to stretch our dollar and make every penny count. 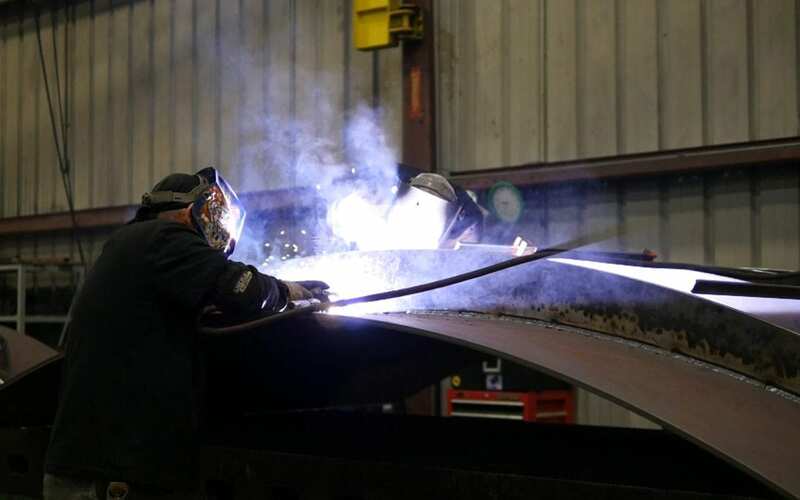 Over-welding by just 1/8” costs nearly three times more in labor and materials. Take the time to evaluate weld sizes on your next job. A little extra training could add up to big savings. If you have any questions about this topic, feel free to contact us at General Air.